I’m back. Things have been topsy-turvy in our family over the last two weeks–more car trouble, plumbing issues, and an out-pouring of love and support that has been truly amazing. With all that has been going on, I didn’t get to ORGANIZE THE MASTER BEDROOM as I had planned. The weekend was rolling around, and I was so disappointed that I had already failed. Then I thought, anything is better than nothing, so I decided to do one good organizing project in the bedroom. Our bedroom as two deep dormer windows. They are cute, but they weren’t really funtioning in any meaningful way. 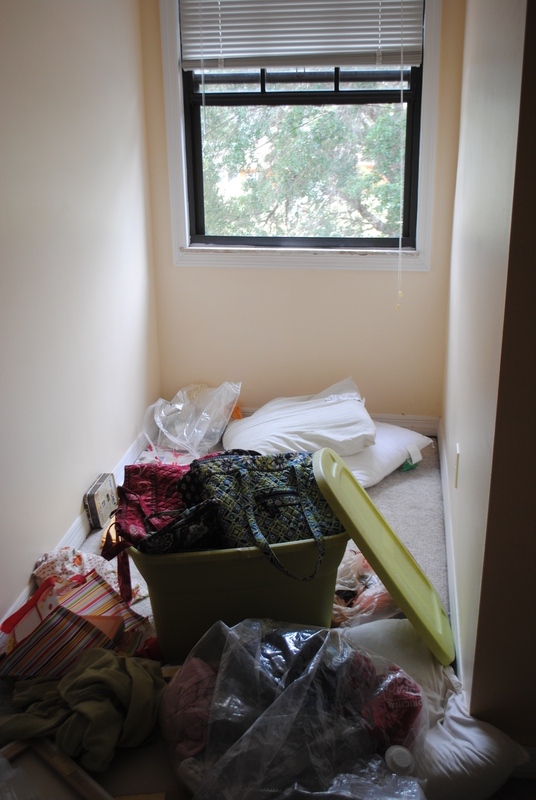 Basically, the stuff that we haven’t unpacked yet was hanging out in these out-of-the-way spaces. And I’ve been digging around in previously tidy bins for purses and warm weather clothing. 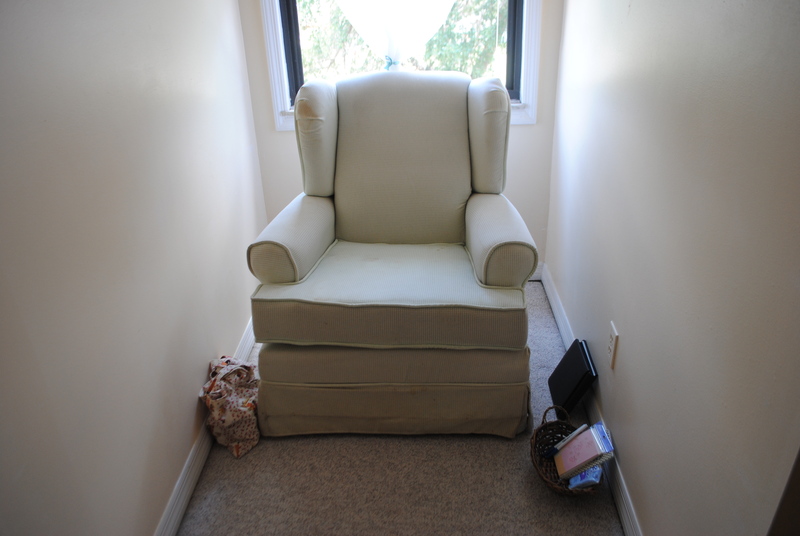 I decided I needed a quiet corner for me–a place to read, reflect, and maybe even knit. I assembled a basket of necessities for my reading nook: a small Bible, a journal, pens, tissues, and note cards. I alslo put my latest knitting project in a bag there. I want to hang some photographs and maybe a shelf. 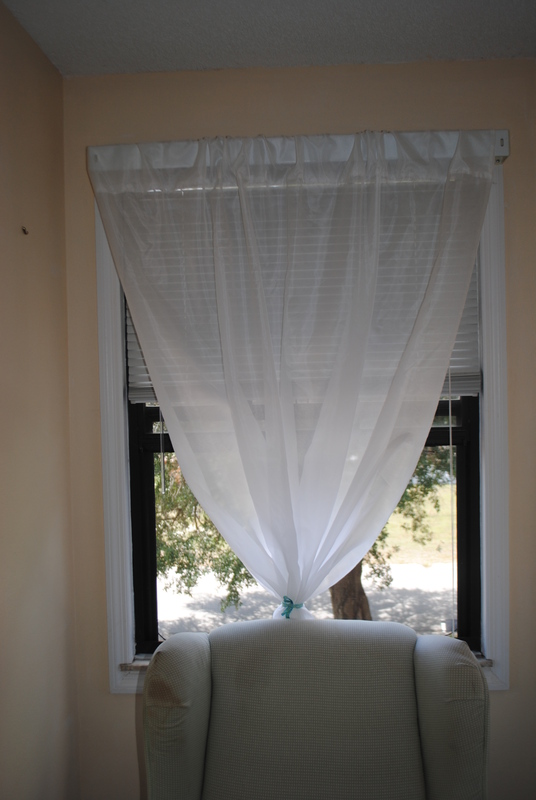 For now, I like my simple curtain with a pretty ribbon. Most importantly, I want to put a slip cover on the armchair. I have no idea why the chair discolored so much while it was waiting to be moved from our old house to our new house. It didn’t look like this when we left it behind in July. Oh well…I think it would look great in white. ‘Bye for now. I’m off to ice some peach cupcakes that you can find here. So proud of you, Erica! I think it’s fun to organize. We got our whole garage finally gone through, now I have to go through my “unfinished” office. We’re making boxes of donations. I told Tony not to call until I go through the office and the walkin closet. lol I SO look forward to getting that finished! It’s only been a year. ha!